Not the kind of Dendrobiums I'm used to, exactly; the shape seems subtly different in a way that I'm unable to be precise about, and I don't recall ever seeing a Dendrobium with veining like that. I'm nearly as burned-out on Dendrobiums as Phalaenopsis, because where I used to work, Dendrobiums were the main other thing, besides Phals, we used to get in (it was something like 70% Phals, 20% Dendrobiums, and 10% other), but Dendrobium has one thing going for it that Phalaenopsis doesn't (so far), which is that I've been able to rebloom a Dendrobium. Only barely, granted. (But more than once, which must surely count for something.) But still. Barely is better than not-at-all. And actually, now that I think of it, my mother, whose track record with indoor plants is . . . I guess the word would be intermittent -- has actually had a Dendrobium for a while and it's done okay. I don't know about reblooming, but with Mom, survival is quite an accomplishment all by itself. I might quibble with the namers of this particular variety a little bit. Last I knew, it took more than two colors for something to be considered a rainbow. (Even the dehydrated marshmallow rainbows in Lucky Charms have three, and they're made by mentally-challenged leprechauns.) But they're fine flowers, even so. They're pretty enough flowers I suppose. I think of most orchids as prom queens. Popular, but boring. I think there may be a few colour varieties - about 7/8ths of the way down this link is a lovely yellow "Rain Dance" with a similar reticulation. And a "Rainbow Dancer" in pale salmon pink. Ugh. I'm with you on the phal and dendrobium boredom. My favorites are encyclias and epidendrums, and my favorites are the frost hardy encyclia tampensis and its hybrids. Well.... 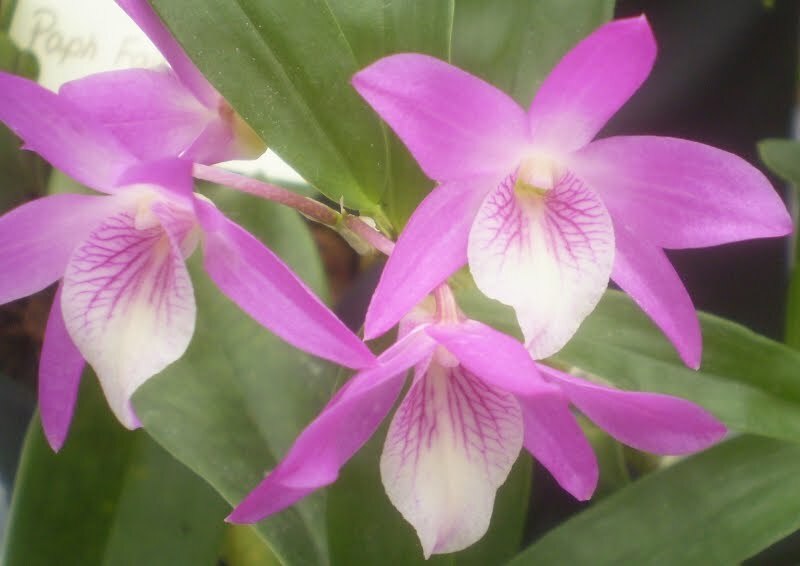 Since Rainbow Dance is a grex name that must be applied to every cultivars with Dendrobium Kurenai as seed parent and D. unicum as pollen parent, I don't think Hisanobu Isogai, the hybridizer, can be blamed for the Rainbow part. According to International Orchid Register of RHS, this grex was first hybridized by Takaki O.N., and registered by him on 1/1/1988.